I’m not sure what it is, but there’s nothing *quite* like the Bedford and Strand in London, and a place the Hoodooist adores. Through a tiny doorway on the corner of (you guessed it) Bedford and Strand, a stairway leads you down to a surprisingly large space for dining and drinking that gets absolutely rammed on weekend nights. 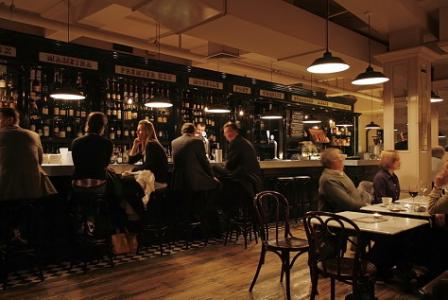 Zinc-bar-inspired, an enormous – beautiful – bar takes all the attention, opposed to the dining area and the few drinking booths on the left, under beams and vines, around random partitions separating the largest table from the rest. I have to admit, I am incredibly biased to the design, in terms of what they were going for, they nailed it on the head. Especially earlier on in the evening, before the place gets crowded. Which is painful since drinks have to be ordered at the bar unless you’re dining. The cocktail list is fairly simple, not particularly adventurous (not a bad thing, though – if you know your strengths), except for a couple of which stand out. 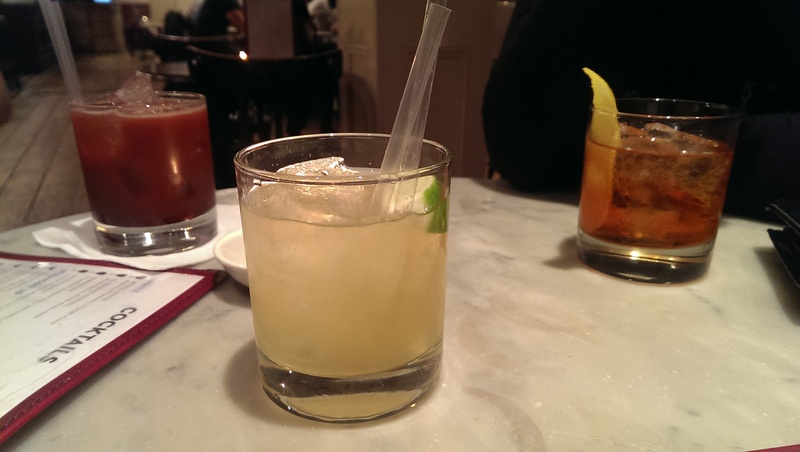 The star of Cocktail Week 2013 stands out as one of their exceptional drinks, the Foxey Lady #2. Col. Fox Gin, Merlet Fraise, Strawberry Puree, fresh lemon, spicy balsamic vinegar. Soft, smooth, and indeed sweet, the drink balanced wonderful with a bit of balsamic savouriness with a spicy kick following. Very easy to drink, great to relax with. The Alchemist, I couldn’t really make my mind up on. Pikesville Rye, Kamm & Son’s ginseng, Benedictine and Peychaud’s bitters. The Kamm and Son’s and Benedictine lead to an intensely herbal drink, luckily the slight honeyed note of the Kamm and Son’s help deal with that – but is then followed by the spiciness of the Pikesville, with a gritty finish. The use of a lemon garnish could instead be substituted for orange, because of the dryness of the drink. This one takes time. Finally, the Ginger Caiprinha didn’t stand out as much as you think it would – but is still a very decent drink. Cachaça, King’s Ginger liqueur, Ginger wine, fresh lime. As much as I love ginger cocktails, it started to feel a bit excessive here, but the Cachaça saved the day. A good drink, but not a great one; decent for 9 pounds. Service is swift, polite. Sure, the absence of table service if you’re not eating can be a trial, but it has its charm in a way – I just know that I will be coming in the early daylit hours to avoid the crowd. Not to mention the over-the-counter food is wonderful. All in all, a bar worth recommending, with a unique style this side of Europe. This entry was posted in Bars & Cocktails and tagged Bar/Restaurant, Basement, Date, Food, Large Groups, Small Groups.